Hi, my name is Christel. If you go out on safari with us it is highly likely that you will not see me as it is Neil, my husband who is our safari guide & driver. I do the office work and spend more time than I would like behind the computer. Sometimes though I get the chance to go out with Neil on our own private safari and I love those occasions! Today we packed our picnic basket with a thermos of coffee and biscuits and headed out inland onto the moor, to do a recce on an off-road track for which we recently got access rights on limited times throughout the year. As soon as I opened the gate onto the track, I saw a small group of Exmoor Pony Stallions gazing at us in their curious and friendly way. 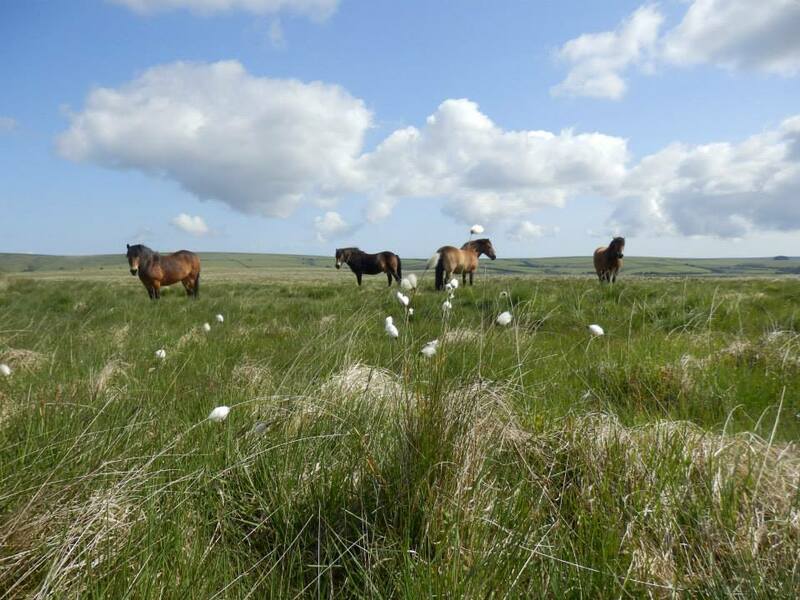 They were surrounded by cotton grass as far as the eye could reach, as well as a variety of birds and butterflies, like buzzards, swallows, skylarks and meadow pipit. The bumpy track winds its way down to a magical remote valley by the river Barle. On the descent we spotted a group of red deer higher up. They stared at us for a while before one by one they started to jump over a fence to get out of sight. Once we were by the river, we nestled down on our picnic rug among the high moorgrass next to the beautiful river with crystal clear water. We drank our coffee and took in the stunning scenery in this secluded spot. Between the rocks and wind-sculpted trees on the opposite hillside, some black cattle were grazing and not taking much notice of us. Soon we were back on our feet to go and explore the riverside. The sound of cascading water running down from various streams to join the river was amazing – wild but so peaceful at the same time! Birds and insects were everywhere and we could both sit there all day to just discover and look at everything that is going on. An old (closed) footbridge over the river adds to the scenery. Closed mine shafts on the hillside give a sense of mystery and make you wonder where the tunnels go to & what happened here in the past. Beautiful wild trumpet-shaped flowers of mimulus were waving in the breeze, rooted among the rocks in the middle of the Barle. As I was standing there next to the footbridge admiring it all, suddenly a bright blue bird flew right passed me, flying fast just above the middle of the river for as far as I could see. I nearly yelled out loud: ‘WAW a Kingfisher!! !’ Even though, unfortunately, I didn’t get it on camera and only saw its back – striking blue – I was thrilled, as I had never seen one before! All too soon it was time to head home. I have decided I am going to book a safari on Exmoor with my husband more often! You have wonderful photos on your blog! We would love for you to become an author at wildlifehub (wildlifepic.wordpress.com). Email wildlifehub@yahoo.com for more information. Thank you very much! I’m delighted you like our blog and the photos. I have followed your blog and will email you in the next couple of days.